Lips are like underwear – normally they go unnoticed, but if something is wrong and they’re uncomfortable it bugs you all day! Lacklustre lips are one of the first-world’s most whined about problems, yet we often don’t properly care for them until they’re cracked, burnt or chapped and we’re scrounging around our bags for something – anything – to put on them! Lips have skin too and deserve care just like the rest of your face. Thankfully, maintaining supple and plump lips is simple and fun – let’s learn how! It’s sometimes easy to forget that your lips form part of your skin because they look so different. Unlike the mucous membrane on the inside of your mouth, the outer visible lip is covered by a thin layer of skin, which keeps it dry and protected. But the stratum corneum or the outermost layer is far thinner on your lips than the rest of your body. This is why lips peel and crack so much easier. The second reason why lips seem so fickle is that they have no sebaceous glands. Rather than self-moisturising, they require outside help to stay supple and not dried out. The plus side of this means that lips don’t need to be cleansed like the rest of the face (aside from removing makeup). Unfortunately the nature of the beast is that our daily life including dry winds and normal wear takes its toll on the lip skin, drying it out. If left unmanaged this dryness leads to splitting and bleeding that can be painful, cause infections and even permanently scar. As with the rest of the skin, UV exposure to the lips leads to painful sunburn (read: paper-mache feeling lips for days), pigmentation, loss of collagen and risk of skin cancer. The long-term result is thinning, patchy, and potentially lethal lips. Things like puckering up for cigarettes or straws day in day out sets in deep wrinkles that treatments can’t fix. If the lips are already dry or damaged, these movements agitate the skin and encourage cracking. Luckily preventing these issues is easy – daily lip care is quick and fun! 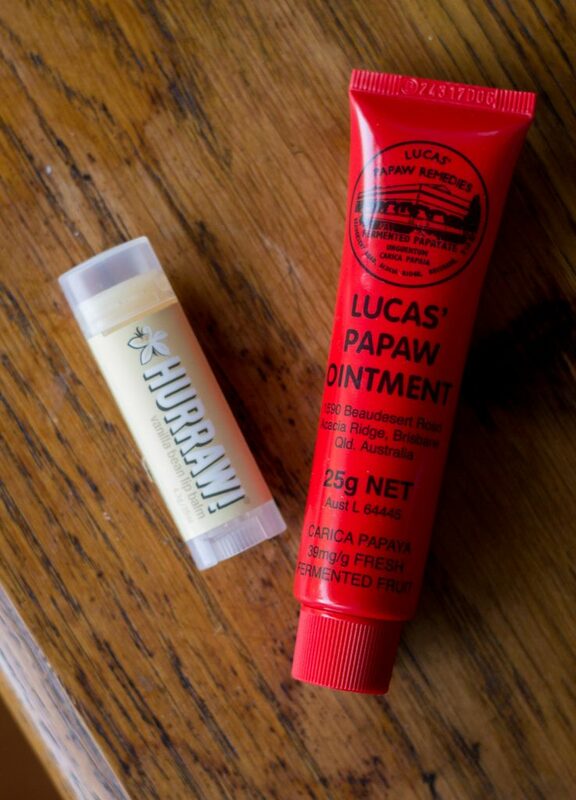 No more looking for lip balm after you’ve got dry lips covered in peeling skin. Healthy lips should always look smooth and shiny and are one of the most flattering no-makeup secrets! I suffer from vitiligo, so my lips and the surrounding skin are very pale except for that centre pink portion. It’s extra important that they are protected from the sun and hydrated to look their best. This layer is designed to be emollient, to soak in and hydrate the lip surface. And that means none of the mentholated Carmex or Blistex which is barely moisturising and has irritating oils. Lanolin or an oil-based product is perfect. The sealant should stay on top of the moisturiser, providing slip and shine and keeping product and moisture from evaporating or being licked off. Petrolatum is a great choice, but preferably with an added sunscreen for daytime. I layer these two products on a few times a day, applying the moisturising followed by the sealing product. I make sure to apply after brushing my teeth in the morning or when I’ve arrive at wherever I’ll be for the day, after lunch, and after brushing teeth at night. At night, feel free to be more generous with your product than during the day to counteract any lip-licking that happens in your sleep and help it last 8 hours. If you’re starting from scratch with a rough set of lips, you may apply the products more often until they’re softened up. Most importantly, find products you enjoy using – this will encourage you to apply them every day. Of course, if your lips are cracked chronically no matter what you try, you should see a doctor to determine if there’s a deeper cause. As mentioned earlier, the repetitive puckering motion trains deep, vertical lines to form across your lips. Not to mention that a cigarette habit is one of the worst things you can do for overall skin health. Not only will the dry formula draw moisture from your lips, but the texture exaggerates existing dryness and won’t lend well to lip moisturiser application during the day. I’m not a massive lip colour fan, but when I wear it I reach for glosses. They trick the eye into seeing a more full moist set of lips. My favourite at the moment is Rimmel Oh My Gloss in Crystal Clear. I personally don’t exfoliate often – hydrated lips don’t need it! But when when lips are feeling flaky or peeling. use a soft clean toothbrush, damp washcloth, or sugar scrub. Do NOT bite or rip off the excess skin – ever. These tips and treatments should keep a youthful, comfortable smile on your face! Enjoy the panic-free life of always knowing where to find your lip balm. I accept thanks in the form of new lip balms to add to my collection.